GATE 2019 Application form: The registration process for Graduate Aptitude Test in Engineering (GATE 2019) begins on September 1st and will end on 21st Septermber this year. 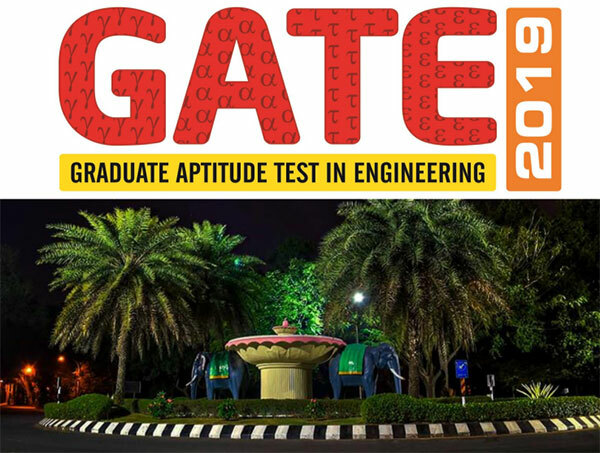 GATE mainly tests candidates comprehensive understanding in various undergraduate subjects in Engineering/Technology/Architecture and post-graduate level subjects in Science. Graduate Aptitude Test in Engineering (GATE) is basically an examination on the comprehensive understanding of the candidates in various undergraduate subjects in Engineering/Technology/Architecture and post-graduate level subjects in Science. GATE 2019 will be conducted for 24 subjects (also referred to as “papers”) and it would be distributed over 2nd, 3rd, 9th & 10th of February 2019. The GATE examination centres are spread in different cities across India, as well as, in six cities outside india. The examination would be purely a Computer Based Test (CBT). GOAPS: http://appsgate.iitm.ac.in is the webpage/web address of the GATE Online Application Processing System (GOAPS). It can also be accessed from the GATE 2019 website (http://gate.iitm.ac.in). and category certificate (SC/ST/PwD) and/or Dyslexic certificate as applicable. View his/her answers, marks and GATE score. GOAPS Registration: A candidate must first register by providing Full Name (as per the qualifying degree certificate), a valid e-mail address, mobile number and by choosing a password. All communications from the GATE Offices will be sent to this e-mail address (ONLY ONE PERSON CAN REGISTER WITH ONE e-mail ADDRESS). Give the personal mobile number and e-mail address, because most of the communication will be through e-mail and/or SMS. candidate. This Enrollment ID will be the reference ID for all future communication. GOAPS Password: The candidate has to choose a password during Enrollment at GOAPS. This password must be remembered along with the GOAPS Enrollment ID to login to GOAPS. It is strongly recommended to choose a password that cannot be guessed easily (it should not be the candidate’s name, date of birth, or some easily guessable string of numbers or letters like 12345 or abcd). Keep your password information safe, secure and confidential. Details of the application fee are given in Table. The application fee is NEITHER refundable NOR transferable. Payments have to be made online by using either net banking or debit card or credit card. As per the prevailing norms, additional online transaction charges or bank charges can be applicable. These charges will be specified on the payment portal. *PwD means Persons with Disability. After due registration, GATE 2019 application must be filled and submitted ONLINE only at GOAPS. Candidates are discouraged from making application through a third person. If someone else (friend or Internet café person) is filling the application on behalf of the candidate, the candidate must ensure that the data submitted are correct. Based on the earlier experiences, submission through a third person is highly discouraged to ensure an error free application. Personal information (name, date of birth, personal mobile number, parents’ name, parents’ mobile number, etc.). Please note that the name of the candidate in the application form must exactly be the same as that in the qualifying degree certificate or the certificate issued by the Head of the Department/Institute in which the candidate is pursuing his/her study. GATE 2019 scorecard will be issued as per the name entered in the application form. Prefix/title such as Mr/Shri/Dr/Mrs/Smt, etc. should NOT be used before name. How to Fill the GATE 2019 Online Application? Application Filling: The GOAPS allows you to enter the data, save partially filled form, logout, and resume filling the form by logging in again. The GOAPS portal is self-explanatory and user- friendly. Additional help information required in filling various fields in the GOAPS portal will also be made available. Before proceed to payment, the candidate is advised to view the filled-in application form by clicking “Save and View Application” button. Please check carefully for any errors in the data entered in the application form. Once the candidate clicks “Submit and Proceed to Payment” button, no further changes to the application can be made. For online payment, follow the instructions given in Section for payment options. Problems in Login into GOAPS: In case of forgotten user ID or password, follow the instructions on the GOAPS portal to retrieve them. Candidates have to specify ANY ONE of the following Identity Documents (IDs) during the online application process and enter the document number specified over there: Passport, PAN Card, Voter ID, Aadhaar-UID, College ID, Employee ID and Driving License. On the examination day, the candidate must bring the original ID proof along with the GATE 2019 Admit Card. Candidates will NOT be permitted to take the examination, in case this original and valid photo identification document is not presented during the examination. For international candidates, ONLY a valid Passport/Government issued ID/College ID/Employee ID will be accepted as the recognized identification document. 1.5 How to Fill the GATE 2019 Online Application?